Dirt easily adheres to the surface of ceramic tiles, especially to more textured surfaces. So regular sweeping is helpful to remove that dirt and debris. Instead of sweeping, you can also use a vacuum cleaner. However, make sure that it does not have a beater bar, as it can dull and scratch the tiles. You can also use the different provided vacuum cleaner attachments to remove the dirt between ceramic tiles and along the edges. Use a soft mop with a grout and tile cleaner. When choosing the cleaning solution, it’s best to consult the manufacturer’s recommendations. For more stubborn stains on ceramic tiles, first do spot cleaning with a same and the same recommended cleaners. 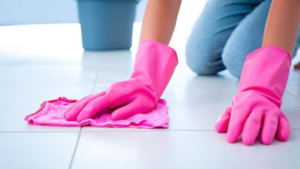 Damp mopping with a cleaning solution will help to enhance the ceramic tile’s shine and color. To effectively clean and sanitize your ceramic tile flooring, you can also purchase a steam mop. You can also use with them without any chemicals involved. However, it’s important to mention that steam cleaning also removes grout sealant. So this method for cleaning ceramic tile floors is recommended only if the grout is unsealed or the sealant is already old and needs a replacement. If you would prefer not to use harsh chemicals for cleaning your tile flooring, especially if you have kids or pets at home, you can use a mix of white vinegar and water. It’s just as effective at eliminating dirt and odour.